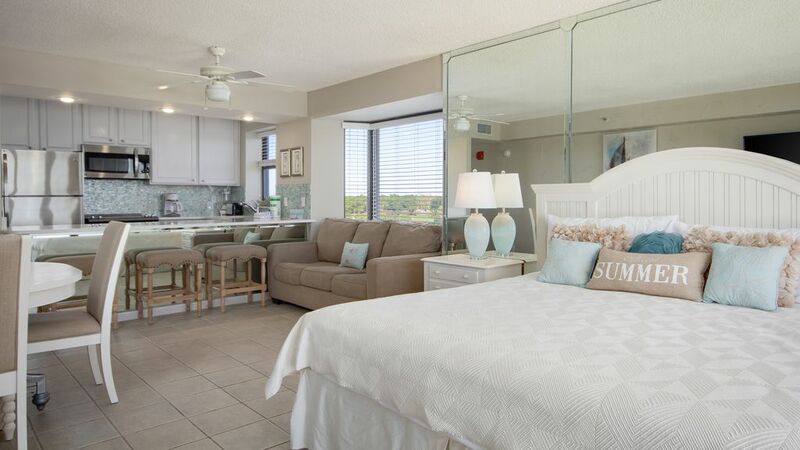 Views of the emerald green waters of the Gulf of Mexico and sugar white sands of the Emerald Coat shine brightly from this beautiful Beachside Two condo. You’ll enjoy comfort, convenience and affordability directly on the Gulf. This newly remodeled efficiency end unit features a luxury entertainment center including a flat panel 42” TV and Bose sound system as well as a fully equipped kitchen with new solid surface countertops and breakfast bar. Sip your morning coffee without missing the morning news or take a break from the norm by listening to the sounds of the lapping waves along the shore. The king bed, sleeper sofa, and additional room with double bed ensure you and your guests have comfy sleeping quarters. Windows in every room allow views of the beach and the beautifully landscaped resort to be seen throughout. Keyless Entry System - No keys to pick up, loose or return. Our guests love this system.